Spring arrives both geographically and altitudinally. Down south in Oklahoma it’s already getting hot and the irises should be done flowering. In the northern woods, spring is taking its time. Go up another 1,000 feet in elevation and you still may find some snow. Edwin Way Teale wrote beautifully about this simple truth in his splendid four volume set which begins with North With The Spring, A Naturalist’s Record of a 17,000 Mile Journey With the North American Spring. Here in the Harvard Woods, spring is vertical. It starts at the bottom and works its way up. Back in April the tiny flowers on the ground thrived in the leafless condition and the kind light of late winter. The smaller understory trees and shrubs have now had their turn- the past few weeks have been a riot of blooming dogwood and hobblebush. In the front yards along Main Street forsythia have been combining with quince, lilacs, apple trees and tulip magnolias for insane color combination awards. Now the forest understory is leafed out and a the woods are in twilight; the light is filtered as though through emeralds and green stained glass. But look up above the smaller trees and you’ll see that the tallest ones have yet to leaf out. Many are flowering; long tassels droop from branch tips to be foraged by hungry warblers. The bare spaces make for easy viewing. In another week or two those birds will be foraging in privacy, but not today. From my second floor window I can see a red-eyed vireo peer and pick at the top of a tall, barely-leafed out ash (according to my Peterson Guide to Trees and Shrubs). Every few moments the bill opens and a song pours out. Mike says it sounds like someone conjugating French verbs. Those leaves are filling out fast. The way things are going, by this time next week I’ll have to be satisfied with just listening to the song. It is amazing isn’t it, the way that some very “flashy” birds can still hide so well. Take, for example, the Baltimore Orioles in my neighborhood … I know they’re here, once in a while I get to see them in my crabapple tree. But, for the most part, I only hear them and I can’t for the life of me find their nest! Great art and great writing! Wonderful paintings and sketches. I grew up idolizing Keith Brockie and M.G. 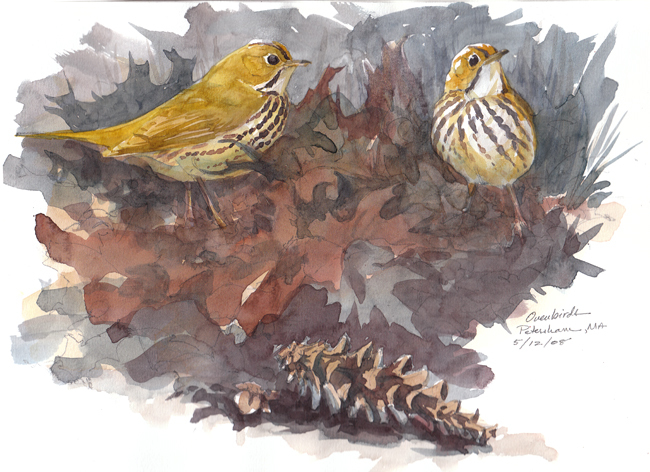 Loates as wildlife illustrators. 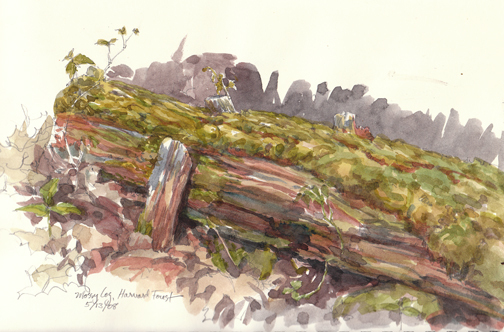 I stopped drawing and sketching years ago – I really need to start again. 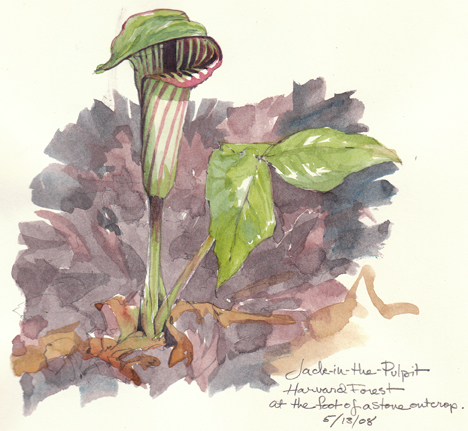 I love the painting of the Jack In The Pulpit – I came across a few in the valley behind our house early this month: http://mungobah.blogspot.com/2008/05/montys-walk-in-valley-fungi-and-flora.html. Your paintings and writing are so damn good they are just beyond envy. The birds “foraging”, the little bill opening and a song pouring out that sounds like someone conjugating French verbs..so nice! 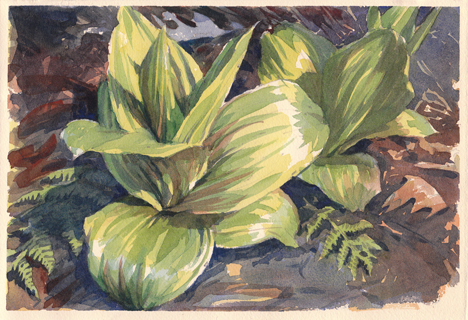 Very nice studies – you inspire me to get outside. Your studies are absolutely amazing- this is what watercolor is all about and in your hands it sparkles with life and energy as you record the things you know and love! Through this seemingly simple act of putting pigment to paper with brush and water you are creating visual poetry! LOOOVE the botanical studies. It’s so good to see you energized by a new place, new birds, new sights and smells. Thank you for sharing it all. Your writing is blossoming and unfolding, too!